Virginia Tech Police have released a composite sketch based on reports of a possible gunman on campus. The school told its community to stay inside because of the report of a possible gunman seen by three teenage girls associated with a D.C.-area summer camp. The campus alert was lifted before 3 p.m., NBC News's Pete Williams reported. Classes were canceled for the remainder of the day. Students were asked not to go to campus. "Person with a gun reported near Dietrick. Stay inside. Secure doors. Emergency personnel responding. Call 911 for help." Text and phone messages were sent to more than 45,000 subscribed to the school alert system, and an email was sent to the entire campus. Sirens sounded outside. “In this day and age we don’t think we had any choice but to issue a campus alert,” school spokesman Larry Hincker said. At an 11 a.m. news conference, police said that they have had no further reported sightings of anyone suspicious. But they said the alert was still in effect and officers continued to search campus. "At 9:09 a.m. three juveniles attending a camp at the university reported seeing a white male, 6 feet tall, with light brown hair outside of New Residence Hall East holding what may have been a handgun. They say the weapon was covered by a cloth or covering of some sort. He was walking fast in the direction of the volleyball courts. He was wearing a blue and white striped shirt (stripes were vertical), gray shorts and brown sandals. The subject had no facial hair or glasses. Officers responded immediately to the area but found no one matching the description. Police have encountered no other witnesses reporting this individual or anything suspicious. Law enforcement officers from VTPD, Blacksburg PD, Christiansburg, PD, and Montgomery County Sheriff's Office are patrolling the campus, continuing to look for the subject." NBC News correspondent Williams said the students who made the report were campers from the D.C. area and are part of the Higher Achievement program. Richard Tagle, CEO of Higher Achievement, confirmed that members of his group were on campus at Virginia Tech as part of a summer program for middle school students in D.C.
"Our first priority is the safety of our scholars and staff," Tagle said. "We have been in contact with them and we have received confirmation that everyone is safe, and are proactively reaching out to parents of students who were on campus." The campers were there for three days and two nights and were scheduled to return home Thursday, News4's Julie Carey reported. 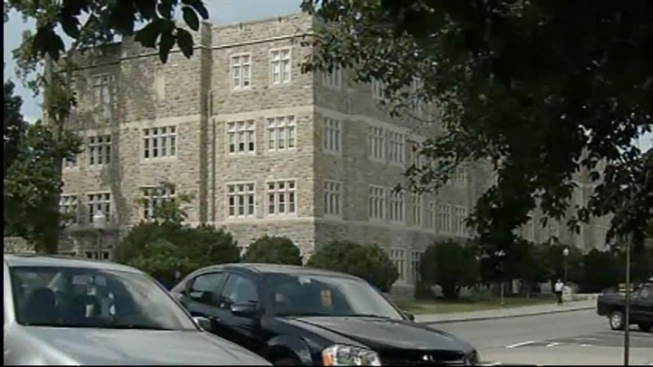 Concerned parents can call Virginia Tech's information line: 540-231-3925. Va. Tech Police Chief Wendell Flinchum said that the three girls who spotted the alleged gunman were interviewed and that the information they gave was deemed credible. Dietrick Hall is a three-story dining facility steps away from the dorm where the first shootings took place in the 2007 rampage. "We're in a new era. Obviously this campus experienced something pretty terrible four years ago ... regardless of what your intuition and your experience as a public safety officers tells you, you are really forced to issue an alert, and that's where we believe we are right now," said Hincker, the Virginia Tech spokesman. Williams reported that federal officials were waiting to hear if they're needed at Virginia Tech. They said there's no verification that there was actually a gun on campus. Security will remain beefed up on campus. One official said the three campers who reported seeing the gun thought it was a long-barreled handgun with a short handle partially covered with a cloth or some type of covering. But, as the university has said, the man who supposedly carried it has not been found. View live pictures of the campus on a webcam by clicking here or by clicking here. Federal authorities fined the school in March after ruling that administrators violated campus safety law by waiting too long to notify staff and students about a potential threat after two students were shot to death April 16, 2007, in West Ambler Johnston Hall, a dorm near the dining facility. and himself. It was the deadliest mass shooting in modern U.S. history. was activated after the 2007 massacre. After the shootings, Virginia Tech started using text messages and other methods besides emails to warn students of danger.